Nicolai Sehested of Trefor Matchracing and Taylor Canfield of US One, have set the early pace at the World Match Racing Tour Copenhagen, both skippers winning three of their four fleet race qualifying heats today. Some of the newcomers to the Tour have also showed flashes of brilliance in today’s light conditions, three-time Danish Olympian Michael Hestbaek (DEN) winning two of his heats against an experienced group that included reigning Tour World Champion Ian Williams (GBR) and his GAC Pindar team. The 49er Olympic gold medallist and Volvo Ocean Race skipper Iker Martinez won one of his heats easily, but finished fourth in the next. Consistency is very difficult in these short-course races lasting little more than ten minutes, and that’s the difference between the talented Tour rookies and the more seasoned M32 sailors like Canfield. There wasn’t a cloud in the sky all day in sunny Copenhagen, the most beautiful conditions you could wish for. Except that the wind took a while to materialise this morning, making the early session for the first group a challenge of sniffing out the strongest of what few gusts could be found on the race course close to shore. Canfield was slow out of the blocks. “We were coming in a bit late and were telling the Magenta girls to get moving,” said the US One skipper. “We were both late accelerating and we got left behind.” But Canfield waited his turn and managed to grind his way back to third, almost to second by the finish. There were no further mistakes by the US Virgin Islander after that early error, as he won his next three heats. 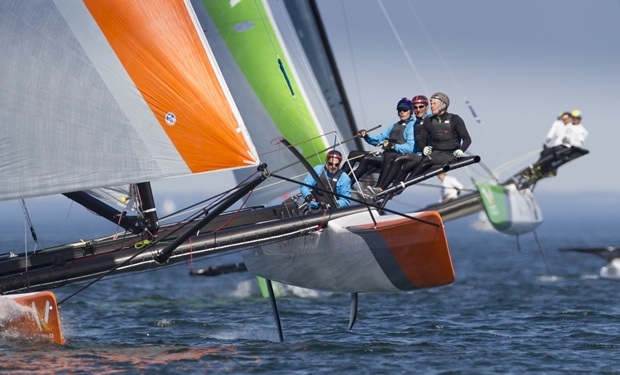 Team Magenta 32 is the only all-female crew of the 20 international teams gathered in Copenhagen, and lies in third, equal with Australian Steven Thomas, after today’s racing. The aim of the first two days of fleet race qualifying is to finish in the top three of your five-boat group to ensure a smooth path towards the knock-out match racing stages. It has been a mixed bag of fortunes for the Swedish crews here. Mattias Rahm leads his group with solid scores of 1,2,2 ahead of Iker Martinez. But the last group of the day, Group 4, produced the closest competition. Ian Williams won the last heat to just about top the group by a single point ahead of Johnie Berntsson and his Flux Team - good work by the Swede who has just acquired his own M32. But the runner-up in Fremantle just two months ago - Star Olympic bronze medallist Hans Wallén - lies in fourth. Bjorn Hansen is in fifth place - not a great start for the experienced match racer although the points remain very close in this group and tomorrow offers plenty of opportunity for redemption.